It’s been a dizzying rise for Piyush Goyal — Modi and Shah’s blue-eyed boy — from BJP treasurer to its go-to man who holds coal, railways & finance portfolios. 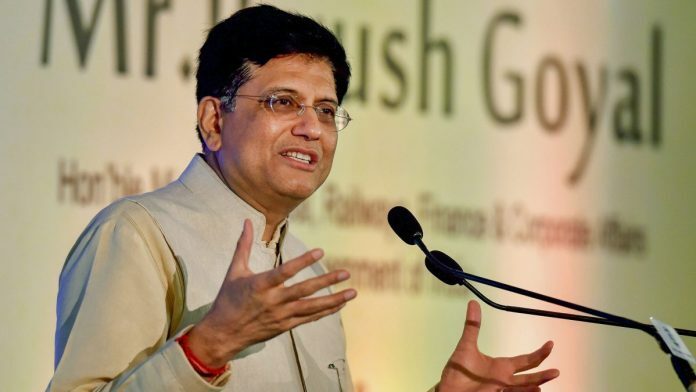 New Delhi: When Piyush Goyal, the Union Minister for Finance, Railways and Coal, as well as the last party treasurer of the Bharatiya Janata Party (BJP), rises to present the budget on 1 February, the shadow of his mentor and Minister Without Portfolio Arun Jaitley will be looming large. A significant portion of Goyal’s speech in Parliament is said to have been written by Jaitley, who is recuperating from an unnamed illness in the US. Jaitley has also written several blogs on Facebook in this time, hoping to marshal the direction of Goyal’s tenure in the finance ministry. But the date and time of Jaitley’s return to India — he is slated to be back in two weeks — and of Goyal’s subsequent journey back to Rail Bhavan from North Block, where the Finance Ministry is located, is already irrelevant. That is because 54-year-old Goyal has been hand-picked by Prime Minister Narendra Modi to once again join India’s most powerful and exclusive club — led by the PM himself, it constitutes the defence, finance, home and external affairs ministers — while the PM’s senior colleagues as well as the BJP’s second rung carefully watch the unexpected elevation. On Wednesday, Goyal was awarded the Carnot Prize for his contribution towards sustainable energy solutions by the University of Pennsylvania. Goyal announced that he would donate the $25,000 prize money to the International Solar Alliance for an award for organisations working with children with special needs and the ones maximising the use of solar energy. Goyal has been here before, when he was made Finance Minister from 14 May to 22 August 2018, while Jaitley was recuperating from a kidney transplant. Last week’s decision to send him back to finance, while he keeps his plum portfolios of railways and coal, has pushed political observers to call him “Modi’s man for all seasons”. But Goyal’s rise and rise in the party hierarchy is perhaps mostly on account of the BJP’s all-powerful president, Amit Shah. As party treasurer, a post he held till he was named union power minister in August 2014, Goyal was able to leverage his corporate network — as well as that of his father Ved Prakash Goyal, also the BJP’s treasurer for several years — to help oil the machinery that brought the BJP to power. Four-and-a-half years later, the party president still hasn’t appointed a treasurer to succeed Goyal. Two years ago, in 2016-17, when the BJP last declared its income and expenditure to the Election Commission, it announced it had raised Rs 1,034.27 crore (compared to the Congress’ paltry Rs 225.36 crore), an indication of Goyal’s continuing influence. He remains the de facto man in charge of raising funds, a terribly crucial position in light of the coming elections. It is also perhaps Lutyens Delhi’s worst-kept secret that Shah, so close to Modi that he is considered the PM’s alter ego, remains somewhat wary of Jaitley, whose independent network of contacts across the capital’s political and social spectrum often comes handy in promoting the BJP and moderating its sometimes bitter messaging. But Jaitley treats the powerful Shah “like an equal”, said a BJP leader on the condition of anonymity, “unlike anyone else in government, including Goyal, although both men [Goyal and Shah] are of the same age”. Since Goyal has no political mass base of his own, it helps that Shah returns his affections, the BJP leader added. Clearly, the trust factor extends to the finance ministry, where no one else in Modi’s council of ministers has made the cut. Not Road Transport and Shipping Minister Nitin Gadkari, close to the Rashtriya Swayamsevak Sangh (RSS) and widely acknowledged to be a PM contender if the BJP doesn’t get a majority in the coming elections. Not Steel Minister Chaudhary Birender Singh, who left the Congress after 42 years and joined the BJP in August 2014. Not Law Minister Ravi Shanker Prasad, also from an RSS family, who cut his political teeth as part of Jaiprakash Narayan’s anti-Emergency movement in Bihar in the mid-1970s. Not the mild-mannered Suresh Prabhu, now in Commerce. Not the feisty Textile Minister Smriti Irani, who was encouraged to take over the “Mahila BJP” mantle from External Affairs Minister Sushma Swaraj soon after the BJP formed the government in 2014. Not Petroleum Minister Dharmendra Pradhan or party general secretary Bhupendra Yadav or Defence Minister Nirmala Sitharaman, all of whom, along with Goyal, are said to be protégés of Arun Jaitley. But Goyal seems to have gone one-up on his colleagues by taking the place of a man he once considered his mentor. When the government needed defending on the Rafale controversy in Parliament recently, Jaitley was pulled out of the Rajya Sabha, although the star speaking role should have gone to Sitharaman. But Goyal knows the PM must be squarely placed at the forefront of all politics and governance goals. So India’s first indigenously-built, engine-less high-speed train will soon be flagged off from Delhi to Varanasi, the PM’s constituency — a route already served by 69 trains (Goyal’s claim that the new train’s eight-hour ride will cut the journey by as much as 3.5 hours than the current fastest train is simply not true — as many as four Rajdhani super-fast trains, from Delhi to Varanasi Junction, take less than nine hours). The much-publicised bullet train will run from the largest city of the PM’s home state, Ahmedabad, to Mumbai. Goyal was the only Modi minister to criticise former RBI governor Urjit Patel, the PM’s former blue-eyed banker who fell from grace and quit in early December 2018. “If you change the ground rules of the game in between and throttle the banking system, who is the sufferer? The people of India… the businesses of India,” Goyal told Times Network. Goyal wasn’t even the putative interim finance minister when he made this statement. And when Raghuram Rajan, Patel’s predecessor, said it was important to ask about the “circumstances that led to Dr Patel resigning and (how) the government must take extreme care in how it proceeds further in its relationship with the RBI”, Goyal told Times Now that Rajan was looking for a political career and “he should announce it soon”. Meanwhile, Modi’s refusal to fill Jaitley’s shoes in the finance ministry, for the second time in a year, with his senior colleagues, either External Affairs Minister Sushma Swaraj or Home Minister Rajnath Singh, has hardly gone unnoticed. Especially since Modi has virtually run foreign policy these past four years, while RSS leader-turned-BJP general secretary Ram Madhav and national security adviser Ajit Doval have trampled all over India’s neighbourhood as well as crisis-ridden Jammu & Kashmir and Assam, pulling the rug from under the government in one state and introducing the religion question into an identity crisis in the other. Into this political potpourri, Goyal has been dropped, once again. Goyal’s three-month stint as finance minister in 2018 was defined by at least two factors. The first, according to two state finance ministers and several civil servants who interacted with him, was his “brusque, brash and egotistical” demeanour, “a know-it-all air” and the fact that he “spoke very dismissively” to them. Second, with his appointment of S. Gurumurthy, co-convenor of the RSS-affiliate Swadeshi Jagran Manch (SJM), and Satish Marathe, patron of the Sahakar Bharati cooperative, as part-time directors of the RBI, he set the stage for the so-called “saffronisation” of the central bank. A key example of this was the sacking of Nachiket Mor, director of the India office of the Bill & Melinda Gates Foundation, who had been reappointed by Jaitley for a second four-year term only the previous year. Gurumurthy’s partner in the SJM, Ashwani Mahajan, had celebrated Mor’s removal, calling his nomination a “conflict of interest”, arguing that the Gates Foundation received foreign funds, of which the RBI is a regulator. Goyal also realised he had to do something quickly and something big at the ministry, both to vindicate the Modi-Shah duo’s trust in him and consolidate his own rising profile. Thus was born ‘Project Sashakt’, his attempt to find a solution to the problem of stressed bank loans. Except that the RBI, in a 12 February 2018 circular, had already stated that all restructuring schemes would be shut down and all companies would have to go through the Insolvency & Bankruptcy Code (IBC). But one day, Goyal told PNB chairman Sunil Mehta, who led the committee looking into the matter, that he was taking “too long” to fix the problem, and that he would hold a press conference that same evening to announce his alternative model. Mehta, according to a finance ministry official who spoke on the condition of anonymity, had no option but to hurriedly present his committee’s recommendations the same day so he could join Goyal at the press conference later. Sashakt, financial analysts say, “has hardly worked”. Similarly, when Goyal wanted to “do something” to expand the tax base, he refused to set up a committee to look at the problem, arguing that it would take too much time. Neither did he want to implement older reports on the subject. “He wanted things done now, right away. You couldn’t explain to him that it was important to understand why the ‘inspector raj’, for example, had been so pernicious,” one civil servant said, pointing out that a simplified tax form had only ended up “tinkering with the massive problem at hand”. At this time, a senior revenue department official was also questioned as to why certain tax collection numbers were becoming public before being made available to Goyal. It transpired that Jaitley, on medical leave, had been blogging on some of these issues. The civil servants readily admitted to the overwhelming contrast between Jaitley and Goyal. The Delhi politician “often seemed overly relaxed because he spent large amounts of his time meeting politicians, corporates and journalists of all hues”, one bureaucrat said, pointing out that the politician from Mumbai “hardly cared to take the advice of those serving him”. During one of the two GST council meetings that Goyal chaired, on 21 July, Opposition finance ministers from Punjab and Kerala, Manpreet Singh Badal and Thomas Isaac, openly protested Goyal’s decision to ride roughshod and carry out major changes to the GST law as well as cut tax on 50 items. In a letter to Goyal after the meeting, Badal pointed out that such changes violated the rules and impinged on the rights of states for proper representation in the council. Isaac, meanwhile, termed the proceedings of the council meeting “unacceptable”. Right or wrong present architecture GST has has been designed through discussions in the Council and Empowered Committee spread over 100 days. Change if we must.But after considered deliberations and circulating the proposals. Exercises like in the last Council unacceptable. Very happy to read that you are back in office, @arunjaitley Ji. Looking forward to meeting you at the next GST Council . Let me confess you were missed. Certainly, Mumbai’s moneyed classes, with whom Goyal is believed to have a very good rapport, would be hard-pressed to believe that this was the same “soft-spoken, personable man” they often met in the city’s local business and social parlours or rubbed shoulders with at several Vibrant Gujarat summits in Ahmedabad. His father’s position and influence as BJP treasurer for several years gave Goyal, a former chartered accountant, an insider’s understanding of the confluence of money power, politics as well as its special version, dynasty. Ved Prakash Goyal was shipping minister in Atal Bihari Vajpayee’s government and both men were very close. The senior Goyal held his own against star BJP general secretary Pramod Mahajan as well as his brother-in-law Gopinath Munde. Educated in Lahore and Banaras Hindu University, Ved Prakash became a full-time RSS worker in 1947-48. But he encouraged his son to study both law and chartered accountancy (he topped the Government Law College in Mumbai and came second in his batch in the Institute of Chartered Accountants of India exam), and Goyal, in turn, has encouraged both his children to study at Harvard. When Gadkari became party president in 2010, Goyal was named treasurer. It helped that he was his father’s son. His time as government nominee to the board of the Bank of Baroda (2001-2004) and State Bank of India (2004-2008) expanded his access. The year 2010, in fact, turned out to be good. He was named to the Rajya Sabha in July and to the Standing Committee of Finance a month later. The following year, 2011, wasn’t so good. As the 2G spectrum scandal spread across the reigning Manmohan Singh-led UPA, it threatened to drag in Goyal. Reports that the CBI was probing Goyal’s alleged links with DB Realty promoters Shahid Balwa and Vinod Goenka, both of whom had been arrested in the gathering 2G scandal, would not die down. According to a story in Dainik Bhaskar, the CBI had information that Goenka, director of Swan Telecom and a suspect in the 2G scandal, had made a Rs 15-crore transaction with Goyal, but that the BJP leader had denied the charge. Goyal admitted that he had, indeed, “advised the real estate business of DB Realty for raising equity”, in his capacity as a chartered accountant and investment banker, but had nothing to do with its telecom business. Soon enough, then Gujarat chief minister Narendra Modi began to prepare his candidacy for prime minister. Over 2012-13, Goyal and Irani were commandeered by the Modi-Shah duo to organise BJP youth all over the country. Social media became an important tool in this mobilisation. Prashant Kishor, now a leader with the Janata Dal (United), was a key element of this campaign. Both Goyal and Irani are said to have done a splendid job. Certainly, Goyal’s ability to work hard is not in doubt. He has pushed UDAY, a power sector reform to resolve discoms’ financial problems and increase their operational efficiency, while UJALA, the world’s largest LED-bulb distribution programme, has made headlines. As railways minister, he oversees a Rs 90,000 crore project that seeks to connect all seven states in the northeast, a region of special focus for the BJP. He also likes the profile that comes with arranging special amenities for pilgrims, whether they are going to the Kumbh in Allahabad or from Rameswaram to Dhanushkhodi, towns in Tamil Nadu associated with the Ramayana, where a railway bridge will be constructed after the last one was destroyed in a cyclone in 1964. As elections near, the importance of keeping all your options open is certainly not lost on Goyal. Last time around in the Finance Ministry, Goyal refused to sit on Jaitley’s chair. This time, he has retweeted Jaitley’s criticism of the CBI officer who not only raided former ICICI bank chief Chanda Kochhar, her husband and his business partner last week, but also named several other people in the bargain. With so little time left before the model code of conduct kicks in, the finance minister will be carefully watched to see if he is able to properly implement the PM’s vaunted initiatives around farm distress and growth. The Congress is snapping at the BJP’s heels and, with the entry of Priyanka Gandhi into active politics as well as an alliance between Akhilesh Yadav’s Samajwadi Party and Mayawati’s Bahujan Samaj Party in Uttar Pradesh, several closed chapters have suddenly been reopened. Piyush Goyal has been in the limelight before. As of 1 February, when he presents the Modi government’s last Budget, he knows the glare will be focused on him. Whether this will be his moment in the sun or darkness at noon, will be clear very soon. Interesting but disjointed. What are the writers trying to convey? Very happy to read that Dr Rajan is “ planning a political career “. Would make a stellar FM.